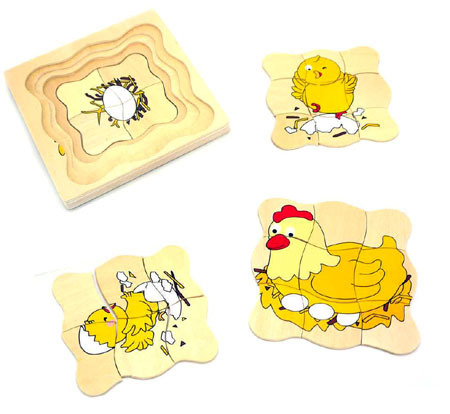 Wooden Egg to Chicken Layer Puzzle is a wonderful educational toy that follows the life cycle of a Chicken. This puzzle has twenty one pieces in four layers of two, four, six and nine pieces. Each layer adds to the last from Egg to Hatchling to Chick to Chicken. This is a difficult puzzle, a fantastic challenge and a great way to encourage your little ones interest in the world around them. The picture shows the four separate layers which fit one on top of the other. We like this because: "A really fun puzzle and a lovely way to learn how eggs hatch and chicks grow."